Tired of paying high prices and getting slow service for Full Color Brochures, Newsletters, Sell Sheets and Flyers? 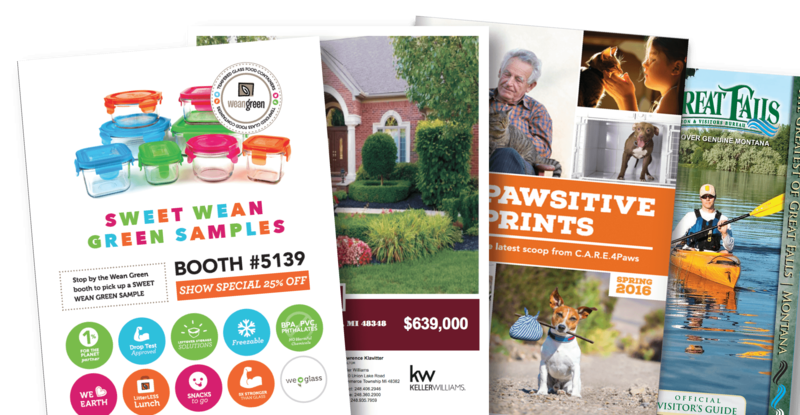 Get an instant quote at discount prices for any 8.5 x 11, 8.5 x 14 & 11 x 17 sized broadsides, catalog sheets, circulars, fact sheets, handouts, leaflets, menus, product sheets, sell sheets, and more? Check out our low prices plus your job ships in 4 to 7 days after proof approval. We offer short run digital and offset brochure printing to give you the best price and quality for the quantity you order. We are located in Great Falls, Mt which helps keep our costs low. Montana has no sales tax. PrintingCenterUSA has a customer satisfaction gurantee, we'll do everything we to make sure your are satisfied with your brochure printing. Call 800 995-1555 today. You'll be glad you did.